ADELAIDE: Rating his knock of 123 as one of his top five innings, Indian batting star Cheteshwar Pujara on Thursday admitted that the top order should have batted better in the first innings of the opening Test against Australia at the Adelaide Oval here. Pujara fought his way to a gritty century even as Team India's familiar batting woes on foreign soil left them struggling at 250/9 at stumps on the opening day of the first Test. Pujara felt it was a decent total as the pitch was difficult to bat on. "I would say it is a decent total because there is enough turn," Pujara said at the post match press conference. "Ashwin will also come into play. It is not an easy wicket to bat on. Sometimes when you are seeing it on TV, it doesn't look like it is doing a lot but when I batted in the first and second sessions, I felt it wasn't easy to bat on. I will share my experience of what line and length to bowl on this pitch with our fast bowlers." "It is the grass. The odd ball is skidding on, and the odd ball is holding a bit more from the grass. I would say it is kind of a two-paced pitch, and it is not easy to bat on," he added. Pujara faced 246 balls for his 123. He said it took him two sessions to figure out what shots he can play on such a surface, adding that is the reason the other batters around him should have applied themselves better. "To be honest, we should have batted better but they also bowled well in the first two sessions and I knew that I had to stay patient and wait for the loose balls," Pujara said. "The way they bowled, they bowled in the right areas. I also felt that our top order should have batted better, but they will learn from the mistakes and put up a better show in the second innings. "It is one of my top innings in Test cricket, I could say top five," Pujara said. "The way the team-mates appreciated it, they were saying it was one of the best." Pujara had to struggle with a hamstring niggle as he accelerated with the tail for company, but it was a case of mind over matter in the end. "It was tough but I was set and I knew I could play my shots, especially when we lost the seventh wicket," Pujara said. "Myself and Ash were having a good partnership but once we lost Ash, I thought I had to accelerate. I knew what shots I could play on that wicket because I had batted for two sessions, and I think it was tough it was considering the weather. 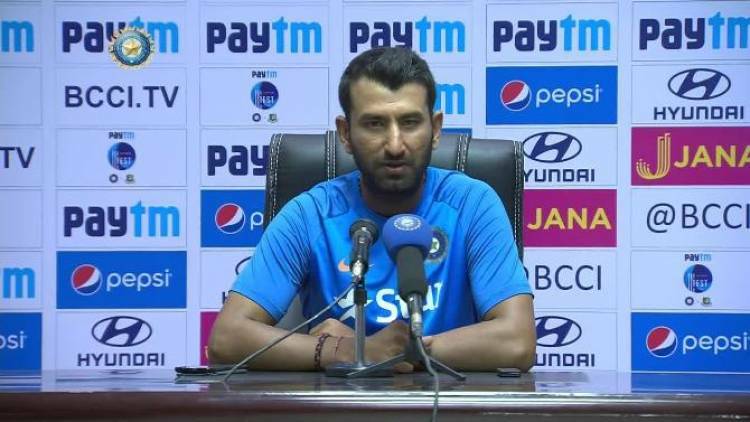 It was quite hot, we are used to it in India but still..."
"My leg got stuck into the pitch, and when I was trying to go for the second run, I had a little bit of a pull in my hamstring but I am going to consult the physio now," Pujara said. "Hopefully it is not too bad." Pujara was run-out off the last ball of the day, a sensational piece of fielding from Pat Cummings bringing an end to his brilliant innings.